Made it up to the Taylors Valley section of Whitetop Laurel for a couple hours today, fishing was tough, only missed 2 fish aside from the school Wyatt and I got into and landed 4 from and lost 3. Water was up, greenish and cloudy, and the fish weren't feeding well. Water levels meant fly fishing would be impossible, so I opted for a 1" gulp minnow on a #12 egg hook behind 2 size B split shot on a 2lb fluorocarbon leader, with a 4lb mono mainline. I drifted the gulp minnow through countless "fishy" pools, runs, current breaks, pocket water, and riffles with no luck. Finally Wyatt and I discovered a large pool full of feeding fish below a bridge. Our fishing style was very unique, dropping the baits straight down and "trotting" them down stream. paying out line and tightening it for a brief second to feel for a bite without pulling the bait off the bottom. 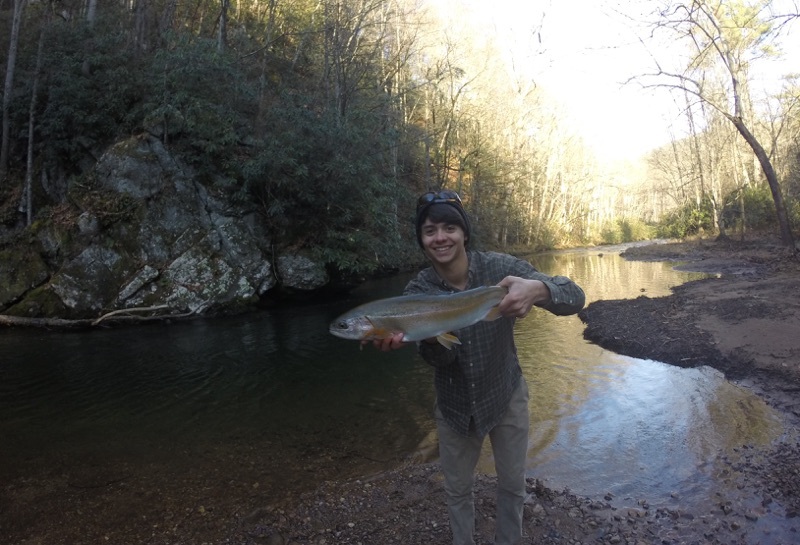 I hooked into a fish about 30 yards downstream and it surfaced and came unbuttoned quickly, a rainbow I estimated to be about 10 inches long. I landed a 10" wild brown soon after that, he had a "bent" fin that suggested he was a stocked fish, but judging from his color and every other fin, it was just a deformity. Wyatt landed a 9" wild rainbow shortly after that, on a "silver fleck" trout magnet with one size B split shot on it. I landed another smaller wild rainbow around 8 or 9 inches after that, and Wyatt followed up with another 9" wild rainbow immediately after that. We fished a bunch of water after that pool, but didn't have a single strike. The snow got worse and worse as we fished, to the point where everything was covered with it, including my numb hands, the fish simply wouldn't strike. We stopped by at Tennessee Laurel on the way back and it was in pretty bad shape, it was very green and cloudy, maybe 2 feet of visibility. I had one strike in about a foot of water on my gulp minnow rig, but that was it, and we headed home. I baked the 4 trout whole with chopped parsley leaves, some sort of stuff simply labeled "Italian Seasoning", and "Natures Seasoning". I also stuffed the "gut cavities" with lemon slices. I know next time to go a little lighter on the lemon slices, as they were overpowering, but the fish was very flaky and tender, so I should be able to do better next time. Thanks for reading! My little wild rainbow, also caught on the gulp minnow. You really have to love fishing to endure that snow & cold temps in the wind. Glad you had fun!